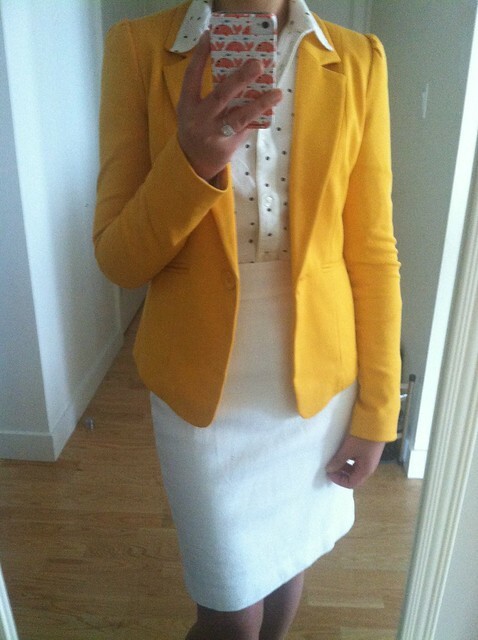 Anyone that knows me knows that I love white bottoms, tops, dresses, cardigans, coats, blazers and handbags. If an article of clothing is white then I’m that much more likely to give it a shot. I love how crisp and clean it looks and I especially love to wear white as a base. Anyway, I digress but my point is that I was so excited when the white pencil skirt (gifted from Annie) arrived in the mail that I wanted to try it on for size. 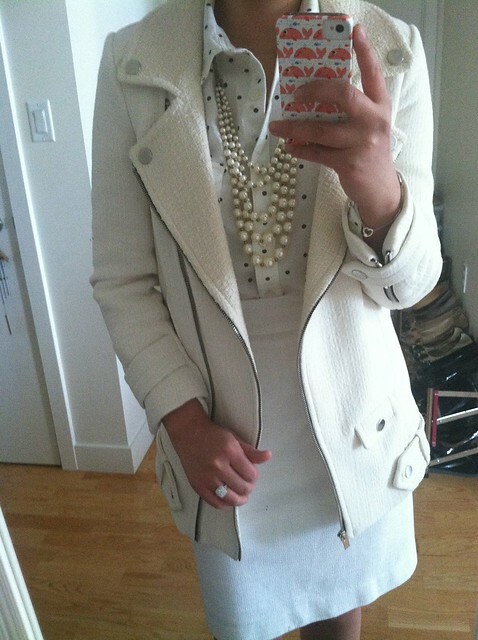 Since I like white so much of course I ended up pairing it with a white polka dot blouse. Unfortunately, the blouse is a bit wide so it didn’t look very neat tucked in to the skirt. I proceeded to throw on a few of my newly acquired blazers and coats and I was quite pleased with all three looks. Now I’m really looking forward to spring when I can wear white without worrying about dirty rain/snow water splattering on my outfits. I’m also looking forward to the extra hour of sunlight so losing an hour of sleep is totally worth it. Thank you daylight savings time! I adore all three looks on you! So happy that you like the skirt and it fits so well. Yay! Are you keeping both Zara jackets? I like that long Zara coat and have been eyeballing it myself but I'm not really sure what to pare with it. I'm interested in seeing the different ways you end up wearing that piece, it's really pretty! Aww… Thanks so much Jess! That means a lot coming from you since you're so fashion forward.